I would like to counter the implication that grannies (gender + maternity + age) might not easily pick up on technical/theoretical ideas. As a start, I’m planning public awareness / art projects using grandmothers’ pictures+names+connections to STEM. This blog is where I’ll collect the info. I’m glad that Grandma got STEM is helping people reconsider their language and attitudes toward senior women. I’d also like to note that there are many ways to make contributions in the world — one is through the STEM fields. My goal is to celebrate women’s work in STEM, not to diminish the contributions of anyone else. The project has sparked new conversations. Some readers have said, “I think my Mother/Grandmother did something with STEM, but I never really talked with her about it. I’ll get in touch with her and get back to you.” I’ve also heard from a number of enthusiastic grandmothers (STEM-mas) directly. Many people have asked… My grandmother did “X” does that count? My answer so far has been… Certainly!!! I intend to be very inclusive with a broad definition of STEM. Senior women who are not grandmothers have also been included. A buddy also said “Don’t forget the arts! STEAM!” But people rarely are skeptical of women’s critical involvement in fields related to arts and humanities. So for now, I’m gonna stick with STEM. I hope you will consider responding to the call for submissions below. The project is ongoing – no deadline. 39 Responses to Why this blog? Barbara was never a mom or grandma, part of the reason she was so amazingly successful. How sad is that honestly. You’ve come a long way baby? Maybe, but neither biology nor government has kept up. Still blocking abortions, morning after pills, childcare vs paycheck inequities, and the problems inherent in returning to work after a long hiatus in any field. I am featuring some women who were not mothers or grandmothers (see post about the concept of Grandmother in Zimbabwe). Please let me know if there is someone you’d like to nominate. Hi Katie, Thanks for your comment! I have participated in the USA Science and Engineering Festival. I enjoyed connecting with so many people of all ages at the SIAM booth and seeing the range of ideas and activities. I *am* looking for someone who might submit a post about her with a personal story or remembrance! What a wonderful project! 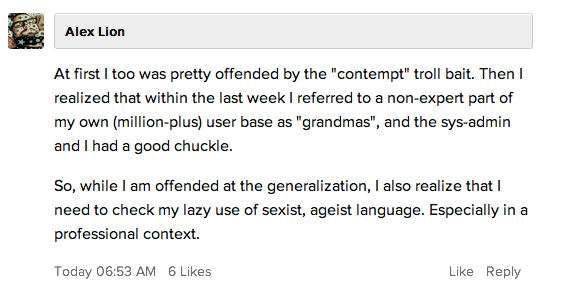 I too get tired of the ageist, sexist ‘mom/grandma’ comments. I mention my 93 yo mom in every tech class I teach. She uses their computer every day, gets upset with friends who don’t read their email promptly, wonders why the other seniors in her retirement center don’t just “look it up on google” instead of spreading false info and she stalks all of us on Facebook! Glad I have her genes. Hi Polly, would you like to send a pic and add her to the project? I’m not a grandma (yet), although I’m 65 years old, and I’m certainly no timid, confused little old lady, unable to comprehend any technology more complicated than an eggbeater! I love this site.. just found it today. thanks BoingBoing! Also, until today I had never met your core acronym “S T E M”. So I encourage you to add a STEM definition or link. Seems to be missing from your FAQ / About page.. Thanks for your suggestions! I am happy to include women who are not Grandmothers, and talk about a broad definition of Grandmother in the FAQ. The definition of STEM is in the upper right corner of the site, (Science, Technology, Engineering, Mathematics +more! ), but clearly I should make it more prominent. I’ll add a page to the banner. Last year I organized a huge event called the STEM Revolution to raise money for a new STEM school . It took a year of intense planning but it was a great success and raised awareness of STEM, too. I am a grandma of several. I was an aerospace manager for many years. My passion is STEM education. Our country is doomed without its growth. When I was a baby, my grandmother would collect blood samples from everyone who showed up to family reunions and other gatherings, so that she could test them for a genetic condition which runs in the family (a dangerous inability to metabolize common anesthetics) and combine this with genealogical research. One surprise was that family members with the condition tend to unknowingly marry unrelated people who also have it! my grandmother (born in 1914) was the first woman to get a master’s degree in agriculture from mcgill university. she was part of a project that taught innovative farming techniques to dustbowl farmers in the ’30’s. when ww2 started she went to med school so she could help out in a practical way, but then got pregnant with my uncle so was forced to drop out. babies & marriage made her ineligible for most interesting jobs after that, but she was a lab tech for a while in the ’40’s. my great grandmother, the mother in law of the woman i was just talking about, was a self-supporting artist, with a serious education and a big following. she was a single parent from ww1 onwards, and raised her kids on the money she made painting. My mother was in the arts, not the sciences, so I was surprised to see on her University of California transcript that she’d gotten an A in Chem 1A (a five-unit lab course). That would have been in the twenties. I got an A in Chem 1A too, but eventually became a songwriter like she was. I do have a lot of science in my songs. You might find the book “Pandora’s Breeches: Women,Science and Power in the Enlightenment” by Patricia Fara of interest. It covers women in the 17th to 19th centuries and their contributions to science. I’ve tweeted it out to Cambridge AWiSE (Association for Women in Science and Engineering) as I’m sure we have quite a few grandma’s in our midst. What wonderful project! I just published a post about it on the California Assisted Living Association’s blog, The Hearth. Hoping that some of our members have residents who would like to submit a story! Thank you very much. They can submit information about themselves and/or their ancestors, colleagues or friends. I look forward to hearing from them! Brilliant idea! A while ago my Mum (now in her 90s) and I attended the launch of a community intranet for some local residents, only to be told by an earnest young woman that ‘old people, over 30’ would find it difficult to engage. To put this claim in context, I was about the first serious researcher of female academic scientists in the UK (200/300 of them, Master’s degree, 1973), my daughter has a PhD in Physics and my mother uses her laptop daily to keep in touch with her (great)grandchildren and many others. Heyho…. We keep trying. My Mom, who is a granny, is retiring from more than 20 years as systems administrator and programmer at a large public university. She started her degree in computer science after dropping out of college twice due to pregnancies (my sister and me). She worked part-time to help support the family until my younger brother started preschool, then she went back to school. I doubt at the time (late 70’s, early 80’s) there were many women, much less with three little kids majoring in computer science. She worked full time after she and my dad divorced. Somehow she managed to raise all three of us well, make it to the occasional basketball game, make each of us feel loved and win numerous awards and recognitions for her programming. Would you like to add a page for her to the project? For my grandson James, both his grandmothers, Judy Lucas a Chemist doing oncology research at Pfizer and I, most recently CEO of SugarSync (www.thekitchensync.co) have always worked in stem and my mother, James’ great grandmother is a physician. As a woman turning 64 soon, I am delighted to find this blog. Thanks for doing this! By the way, is this the Rachel Levy who taught at Carolina Friends School some years ago? Yes it is! Hi Joan! I am so happy that you found the blog, and that you enjoyed it. If some CFS students would like to interview senior women in STEM fields and make submissions (video, narrative, interview, art, etc) that would be terrific! There are plenty of amazing women to choose from in the triangle area. Probably plenty just among CFS parents! Rachel I love you. Finally a “place” online I can feel like one of the crowd (of techie grandmas that is). Retired since 2007. Miss my work. I’m looking for pictures etc to share. I am a grandma (of six) who really does get STEM – I co-founded a publishing company that promotes STEM topics with character education in a literacy platform. From now until April 1, 2014, get a free copy of our second e-book (What’s the Matter?) to see what I mean! Simply enter the coupon code FreeMatter at http://www.entelechyed.com/entelestore_ Read about this grandma at http://www.entelechyed.com/about_us and http://www.reneeheiss.com I welcome your comments! Just a quick note here while I figure out what to say in a longer, biographical post. While STEM is important and certainly an appropriate set of fields for girls and women, I think there is a bigger message behind the push for science, technology, engineering, and math: Systems Thinking. The ability to see the parts and relationships that make up a whole system fuels many of the thought processes used in successful STEM projects. But it goes way beyond STEM. Lots of women who manage complex households and solve difficult domestic problems every day don’t think of themselves as STEMers but really are just as adept as those who earn a living in the “hard” sciences. My Grandmothers (born in the 1880s) were perfectly capable of understanding STEM concepts but they made other choices. It would have been difficult to explain computing to them because they lacked background knowledge, not because they lacked intelligence. My mother was both a practicing scientist and a science teacher (5 grandkids). She had a great time with the TRS-80 I gave her. I’m now a 3-times grandmother and am building a virtual museum on the History of Computing in Learning and Education (www.hcle.org). IMHO, girls need to develop confidence, competency and creativity so that STEM is an option for them. Let’s give them the role models and the education they need to make their own choices. And don’t worry too much about Grandma. Just because some young punks make ageist slurs, she knows their comments tell us more about their sloppy thinking than they do about hers!